Last Sunday, Mommy Jane brought 5 Little Angels to Kidzania Kuala Lumpur for the new activities launched by Kidzania recently from 18th March till 31st March 2017. Mission Possible as Ejen Ali is a task where my Little Angels need to complete all 4 main missions i.e. NEURO, TEKNO, INVISO and KOMBAT to equip themselves with M.A.T.A. skills to be qualified for the Mission Possible Grand Finale. All missions accomplished will determine which M.A.T.A. agent will suit them best. Ejen Ali is a story of a naive, under-achieving boy who accidentally binds himself to an intelligence device called IRIS belonging to an espionage agency named M.A.T.A., forcing him to serve as a secret agent whilst juggling his already chaotic life. Through his missions, Ali grows from being a dreamer to a doer, a loser to a leader. A boy who when faced with impossible duties and challenging circumstances, discovers his true potential. The 4 pillars of M.A.T.A. represent the 4 disciplines a M.A.T.A. agent can specialise based on their individual set of skills. In Mission NEURO, agents are the intelligence officers. They are made up of people who have an aptitude for retaining, analysing and gaining information. NEURO agents are good at strategic planning and problem solving. INVISO agents must be quick and stealthy. Here, my Little Angels are experts in the art of concealment, infiltration and undercover. They are capable of penetrating enemy lines by blending in. They excel in social skills and are good at reading people. KOMBAT agents are the strongest and best fighters. Often possessing the physical strength and technique to break through any opponent or obstacle, they are also strong inteamwork coordination, and the ability to think and act fast on their feet. TEKNO agents are the tech experts. TEKNO wields intricate weapons and executes specialised tasks, ones very few are able to. Once my Little Angels had completed the 4 missions, they will proceed with the Mission Possible Grand Finale. This will be the final stage to unleash their potential in being a skilled agent and one step closer to being certified as a M.A.T.A Agent. After completing the final stage, they are a certified agent for 1 of the 4 missions. KongratZ to all my Little Angels for completing all the missions possible at Kidzania. 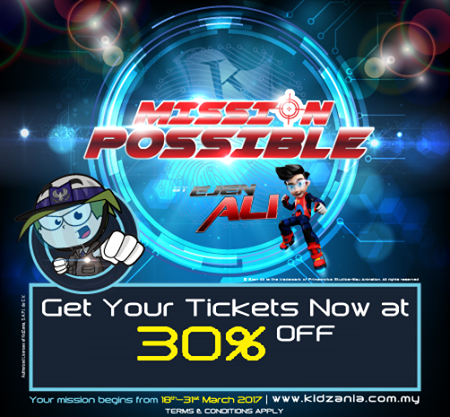 Kidzania is having 30% discount now for kids who love to join the Mission Possible by Ejen Ali till 31st March for online purchase only. 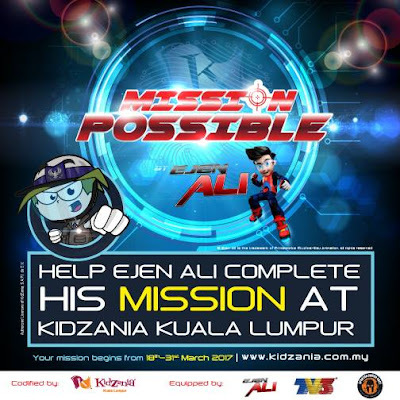 For more information, do visit Kidzania website at www.kidzania.com.my and facebook page at www.facebook.com/KidZania-Kuala-Lumpur. For each completed mission, my Little Angels earned 20 Kidzos points as compared to normal works range from 8-12 Kidzos at other Establishments. Upon completion of the final mission, they collected 50 Kidzos. My Little Angels were so happy because they had collected so much on Kidzos on that day. My Little Angels were so happy and they enjoyed each and every mission at Kidzania. They learned to work as a team, act as an undercover, planning, problem solving and become tech expert. Mommy Jane was very proud of their achievements. Ejen Ali truly inspired me to bring my Little Angels to Kidzania so that they can learn to become like him too and to remind them that nothing is impossible. As long as we work hard for it, we could achieve our dream too. Shini, yes they are. Work hard and earn more for this mission. Your little angels are so adorable! It must be so fun. Gelli, they enjoyed themselves so much. Different mission and different job scope. Such a fun event for the whole family. Kelly, fun for Kids coz' this mission is for Kids only and not adults. What a great time for the kids and bonding time for the whole family. Congrats to your kids for completing the mission. Joy, they can make new friends too. This sounds so much fun for sure! For some reason, kids love to play as a special agent. Hope we have the same adventure in my country. MR, hope Kidzania will reach to your country soon. Miera, maybe she wanted to go with friends instead. More fun to them. such a good deal! will definitely go to visit! Qian, hope your children had enjoyed themselves there. 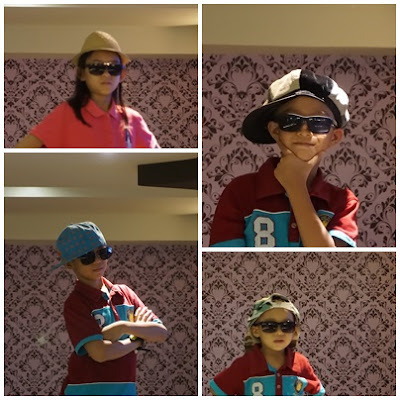 Everest, l am so happy seeing my children dress up. They really look cute.